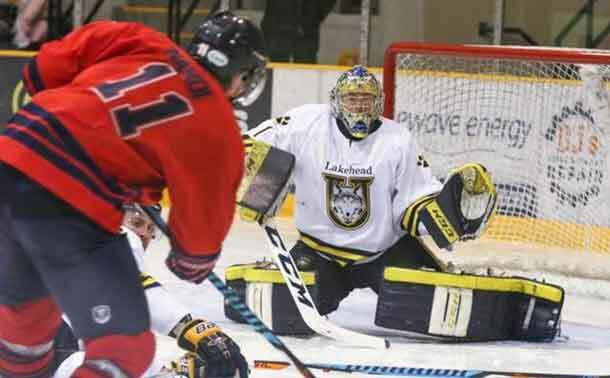 On 13th September, the Warriors’ Men’s Hockey Team kicked off their preseason against the Brock Badgers. The Warriors played a strong all-around game to earn the 2-0 victory. New goaltending recruit Julian Sime impressed with his strong play in the crease as he earned his first shutout as a Waterloo Warrior. The Badgers began the game skating better than the Warriors, pressuring the home team on the fore-check and through the neutral zone. They controlled the puck for long stretches of time in the offensive zone but were unable to generate quality scoring chances. The Warriors came back from the first intermission a much better team. They skated better, made crisp, toe-to-toe passes, and had strong offensive zone entries. They were rewarded early, as right wing Zac Coulter buried a chance on the rush to put the Warriors up 1-0 just 42 seconds into the second period. The game then began to open up and forward Keigan Goetz put the home team up a deuce with a nifty deke and finish in tight 8:22 into the second period. The Warriors had a 5-on-3 power-play with 5 minutes to go in the period but were unable to capitalize on a couple of chances. Play in the third period was more back-and-forth than the previous two, with numerous scoring chances for both teams. However, the goaltending was the storyline of the period, as Sime and Badgers’ goalie Alex Brooks-Potts made impressive saves and kept the score at 2-0. The Warriors’ penalty kill was strong as well, with defenceman Connor Lovie showing good hustle to stymie a few scoring opportunities. The most impressive Warrior of the night was goaltender Jordan Sime, who stopped all 32 shots he faced. The hybrid goaltender made some stellar saves, including two in the second period on breakaways and another toe save third to keep the Badgers off the scoreboard. It was not without help from his teammates who sacrificed their bodies to block shots and limit scoring opportunities. Most impressive was a block in the third by forward Jacob Cascagnette who was grimacing in pain as he helped clear the puck before heading to the bench. The Warriors next preseason game is on the road against the Western Mustangs on 21 September and they open the regular season on 3 October at the Ryerson Rams.